Considerable numbers of human monoclonal antibodies are now approved drugs or in drug pipelines. 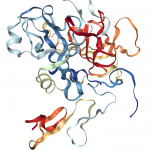 Similar to other proteins, monoclonal antibodies-with specificity to the antigen-binding regions of the antibody drugs-are useful for determining the drug’s presence and concentration in blood or other tissues. Occasionally anti-ID mAbs will be a mirror image of ligands for the idiotype. Our approach is to immunize with the purified antibody (or Fab fragment) and to screen against the antigen IgG and an irrelevant IgG as a control. Antibodies (anti-ID) with the correct specificity are expanded. Specificity to the variable region is confirmed using the ligand recognized by the antigen antibody.